After a slow start, the economic recovery has finally hit its stride; the Los Angeles region is now close to regaining all of the jobs lost during the Great Recession. According to the most recent data from the Bureau of Labor Statistics (BLS), total nonfarm employment increased by 1.6% over the past year with growth in the professional and business services sector increasing by an even stronger 3.3%. The largest jump was construction employment, which has increased by 6.8%. Over the past year the local unemployment rate has declined from 8.3% to 7.2%. Employment growth in L.A. County is expected to average 1.2% per year (or 257,000 new jobs) through 2019 according to the L.A. County Economic Development Corporation. 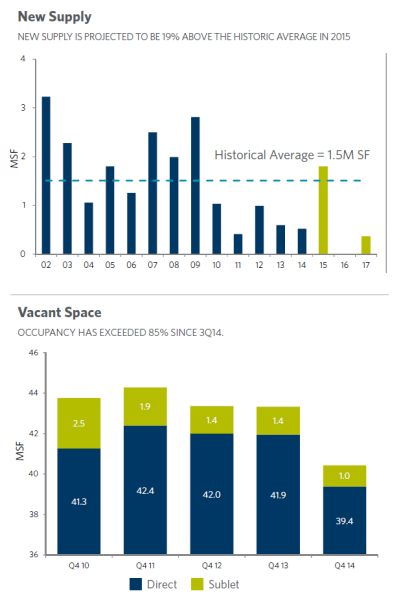 As of the close of Q4 2014, office vacancy stood at 14.8%. This represents a drop from the 15.2% in place three months ago and a substantial drop from the 15.9% metric posted one year ago. Increased demand for office space from expanding firms in tech, media, entertainment, and as of late finance and law has driven six consecutive quarters of declining vacancy. 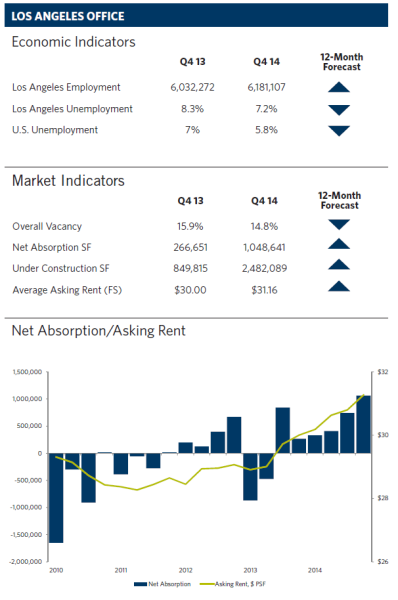 The L.A. office market recorded over 1 million square feet (MSA) of occupancy growth in Q4 2014. This is the strongest quarterly growth posted in eight years and brought annual net absorption figures for 2014 to 2.5 MSF. 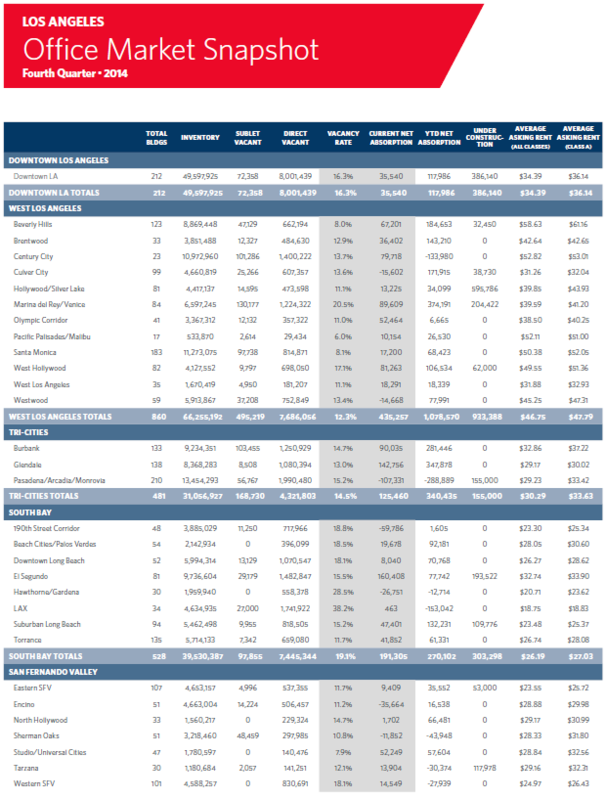 The West L.A. market experienced the strongest levels of growth; the Marina Del Rey/Venice submarket alone accounted for 375,000 SF of positive net absorption in 2014. This trade area includes Playa Vista, arguably the hottest area for office space in the region. West L.A. continues to lure tech companies; among the most notable deals of Q4 were Yahoo’s lease of 130,000 SF at Tishman Speyer’s The Collective at Playa campus and Google’s purchase of 12 acres next to the Spruce Goose Howard Hughes hanger known as the Hercules Campus. 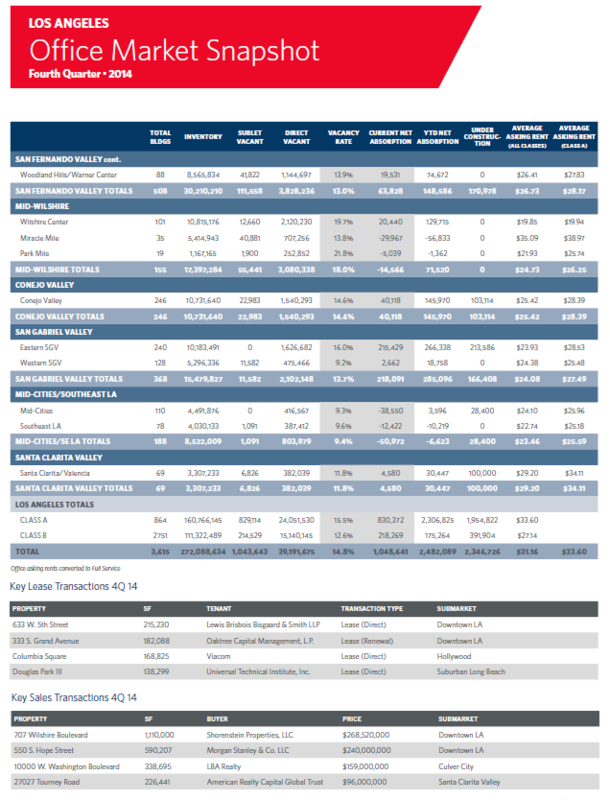 Deal activity was strong in 2014; we tracked over 16.0 MSF of gross absorption. With vacancy falling and demand up, local rents have posted their second consecutive year of growth. Though there are wide variances depending on location and class, the average asking rent that we are currently tracking for the market is $31.16 per square foot (PSF), on an annual full service basis. This is up 4.2% over last year; and almost back to pre-recession levels. However not all of the region’s submarkets have felt this trend equally; the strongest gains have been in the West L.A. markets where demand has been brisk and the increasing dominance of creative office space is playing a role. While this type of space typically allows for greater worker density and greater efficiencies, it typically is anywhere from 20% to 40% more expensive than commodity office space. The region’s development pipeline is starting to increase; 500,000 SF of new product came online in 2014. 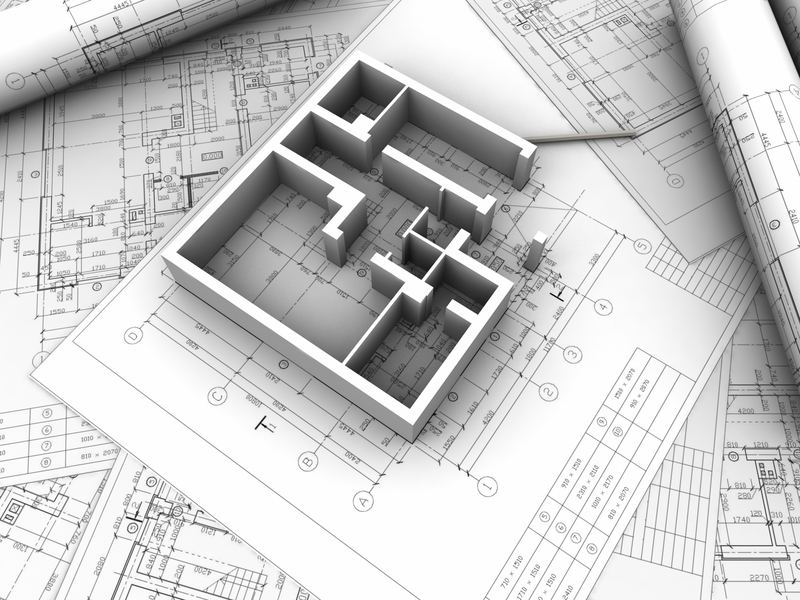 There is an additional 2.4 MSF of office space currently under construction. Three markets account for most of this; West L.A. has 933,000 SF in development (much of it in the form of creative office space geared towards tech users), Downtown has 386,000 SF underway and there is 303,000 SF being built in the South Bay. The remainder of what we are tracking is a mix of speculative and build-to-suit developments spread across multiple submarkets. Th ough development levels are up, increasing levels of demand heading into 2015 should ensure that vacancy rates in the region continue to drop. Though development levels are up, increasing levels of demand heading into 2015 should ensure that vacancy rates in the region continue to drop. However, it will likely still be at least a couple of years before the market approaches equilibrium (vacancy at, or near, the 10.0% mark) between supply and demand. In the meantime, while leasing conditions still favor tenants, the landlord position has strengthened considerably. 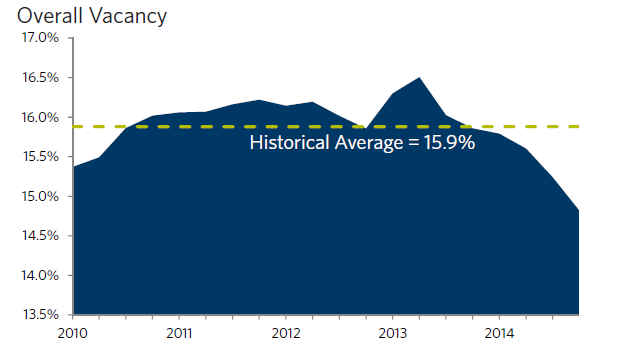 Outlook• The current vacancy level of 14.8% is the lowest recorded since 2009. • Creative office repurposing will raise asking rental rates in tech centric office nodes. • Asking rates will increase in 2015 driven by increased demand, new construction and new owners looking to achieve upside from their newfound assets. 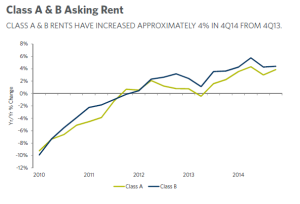 CLASS A & B RENTS HAVE INCREASED APPROXIMATELY 4% IN 4Q14 FROM 4Q13. The information contained within this report is gathered from multiple sources considered to be reliable. The information may contain errors or omissions and is presented without any warranty or representations as to its accuracy.